Mei: IZUMO KAMI FUJIWARA YOSHITAKE. Blade length(nagasa) : 51.1cm or 20.118 inches. Sori :0,8 cm or 0.315 inches. Width at the hamachi : 2.9 cm or 1.14 inches. Width at the Kissaki : 2.14 cm or 0.843 inches. Kasane : 0.69cm or 0.272 inches. with small sori and longer kissaki healthy volume. Kitae :itame hada and mokume hada mixed with masame hada. Boshi:midarekomi round shape deep nioikuchi hamon. a friendship with the Hojoji School. son succeeded Yoshitake as the Second. Saya :On the black ishimeji flower is design. waves and flying birds are engraved with gold color. Menuki :On the syakudo plate, bird is engraved with gold color. flower is engraved with gold color. Kozuka: On the syakudo nanako plate, Matsu tree is engraved. 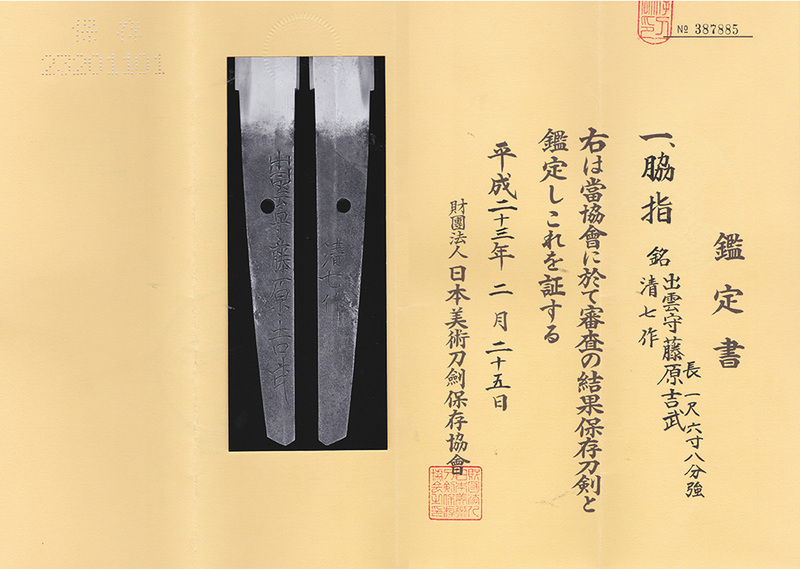 From Aoi Art: This wakizashi is wide and thick healthy blade. The sword is very similar with Hojyo-ji Masahiro and others. The signature Kiyoshichi is very rear. Koshirae is also nice condition.